The Muffin Boutique promises fresh baked muffins hand-made daily by nice people. Was it true? I was out to find out. 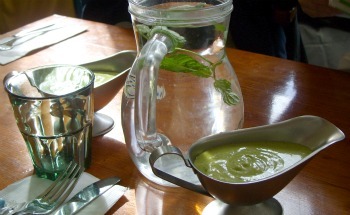 Except for the pages of our Israeli Food section, I don't write about food often enough. That isn't because I don't like to eat -- on the contrary I love food and I love eating out in Jerusalem. I'm usually so immersed in the experience, however, that I forget to take pictures and write about it. It's a mistake I should remedy, and that is why I paid a second visit to the Muffin Boutique. 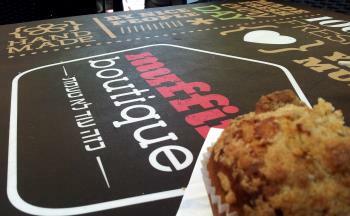 The Muffin Boutique is a new place that opened this summer on Ben Yehuda Street. And as the name implies, it serves muffins and as the tables outside proudly proclaim, they are "hand-made, baked fresh every day, by nice people." I went on my first investigative visit there two weeks ago, fully intending to don my mantle of food blogger. My attention wavered from my journalistic mission when I first cast eyes on the wooden shelves where small trays displayed a modest amount of muffins. They were so artfully arranged that I just stood there, enjoying the view and reading the labels. The limited number of each kind made it clear these baked goods had not been mass produced. It took a long time to decide on just one muffin but finally I chose a vegan lemon-poppy one. I sat outside under the Muffin Boutique's parasols on the Midrechov with my treat and my coffee. I admired the muffin and turned it all around before taking a bite. Then I bit. And that was it. I was smitten. 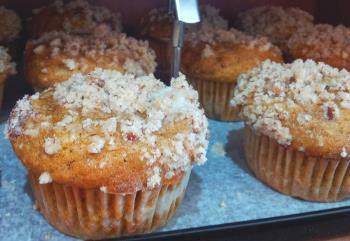 The top of the muffin crackled delicately, revealing the fresh, light crumb inside, rich in lemon rind and poppy seed. I was so enchanted that when my daughter joined me, I kept urging her to try this. Instead, she ordered a bagel, which unlike some bagels we've had lately, was not sweet, a huge plus right there. (Why would anyone make a sweet bagel to serve with lox and cream cheese?) She loved the bagel's texture and chewiness and the vegetables were really fresh and crispy. Of course, she might have enjoyed it even more if I hadn't kept pestering her with calls to "...just smell this muffin!" and "Try this -- just one bite, you just have to try this!" and "This is like ... the perfect muffin!" So you see, I was a little too distracted by my lemon-poppy dream to write a coherent review. I would have to return. The second time around, I was determined not to fall in paroxysms of delight and to just do my job. There were no lemon-poppy muffins to tempt me, as they were sold out. Lots of other alluring offers remained, though: banana-chocolate chip, blueberry streusel, raspberry streusel, just to name a few. I almost went for the pumpkin-sour-cream, but this is Jerusalem-Insiders-Guide.com, so I was responsible made the Israeli choice: the halva muffin. See, there is such thing as a Middle Eastern muffin! Let's just say my best resolutions not to swoon almost fell to the wayside and this little post almost didn't come to be. 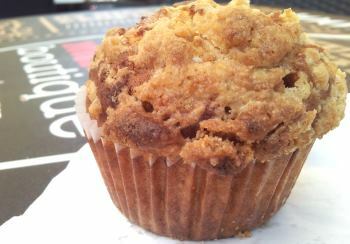 I was a bit concerned because I find halva often too sweet for my taste, but this muffin was not. It was nicely crusty on top and as delicious all around as the lemon-poppy. The sweet-sesame flavor was definitely there, without being overpowering or cloying. Sitting in the shade on Ben Yehuda Street on a quiet summer day, eating my halva muffin, savoring the sweet taste of Jerusalem ... it was a perfect moment.